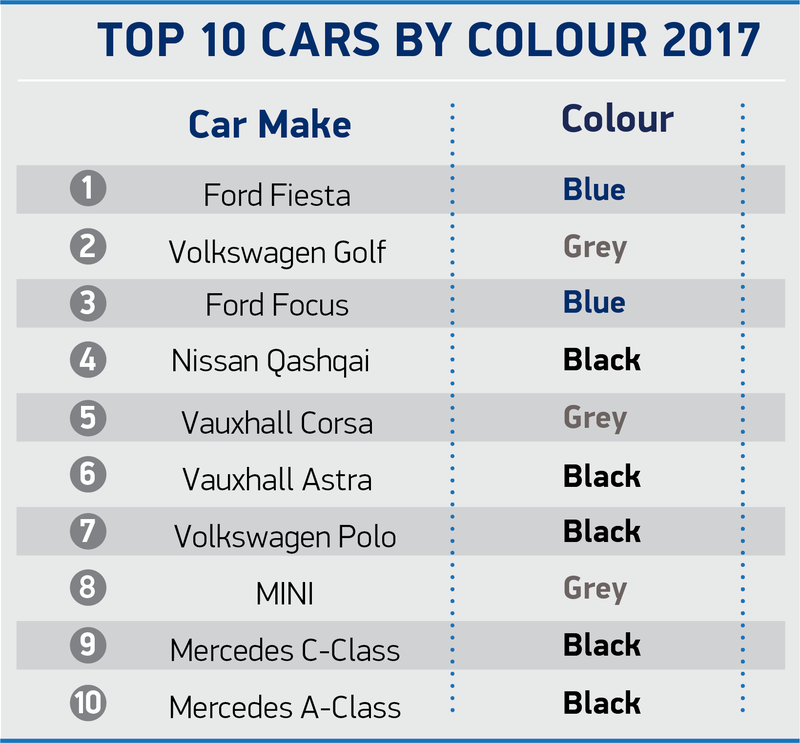 Black knocks white off the top spot as UK’s favourite new car colour for first time in five years, with more than half a million registered in 2017. 60% of new cars registered in black, grey or white – with a primary colour not making the top three for seven years. Red falls out of top five, now accounting for less than one in 10 registrations as silver makes comeback. Record demand sees bronze re-enter top 10, the first time since 2011, as brown falls from favour to 11th place. Black is back as the colour of choice for the UK’s new car buyers, taking top spot in 2017 for the first time in five years,1 according to figures released today by the Society of Motor Manufacturers and Traders (SMMT). More than half a million (515,970) buyers opted for black last year, sending white tumbling to third place after four years at the top. 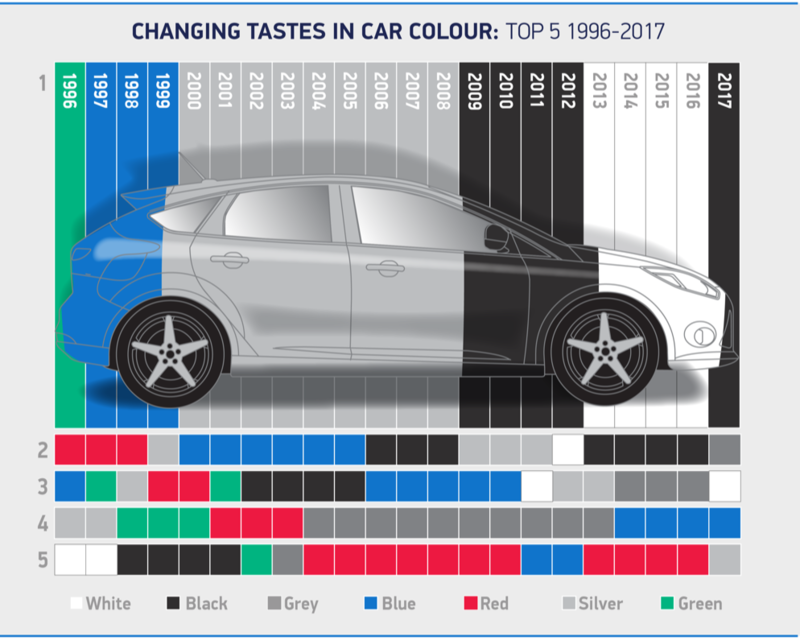 Grey is now the nation’s second favourite, as monochrome colours continue to dominate the market with almost 60% of the 2.54 million new cars registered in 2017 ordered in black, grey or white. Blue is now the only primary colour to feature in the top five, with red falling one place to sixth in favour of silver. Green, orange, bronze and yellow made up the rest of the national top 10, with more buyers than ever before choosing orange and bronze. The trend saw bronze enter the top 10 for the first time since 2011, replacing brown, demand for which fell by -33.2%. Gold’s popularity was the fastest growing, with demand up 19.1%, although it remains a niche choice making up just 0.2% of the market. Regionally, buyers in Northern Ireland, Scotland and Wales bucked the overall national trend, with white remaining their firm favourite. Meanwhile, blue was more popular in Northern Ireland and Wales, ranking third most preferred choice. In a North/South divide, motorists in the North of England opted for white as their number one colour, 2 whereas those in the South preferred black. The West Midlands and East Midlands were also divided, with black coming out on top in the West and grey in the East. Picking a colour is one of the many exciting decisions to make when specifying a new car, as well as selecting from the cutting-edge safety and comfort tech available on the latest low emission vehicles. Manufacturers are continually investing to bring more choice to car buyers, including more colours and colour combinations than ever before. Grey saw highest number of registrations on record, at 500,714, also achieving its highest-ever market share. Bronze rose three places to take a top 10 position for the first time since 2011, with demand growing 39.5% to 12,421 units. Orange was increasingly popular in 2017, with demand growing by 9.4% to its highest-ever level of 19,064 units. Yellow clung on to 10th place, just overtaken by bronze as demand slid -17.1% on the previous year. Pink’s popularity appears to be waning, with just 1,327 registrations – the lowest since 2011. Mauve also fell further out of favour, with a -32.1% fall in demand on the previous year.